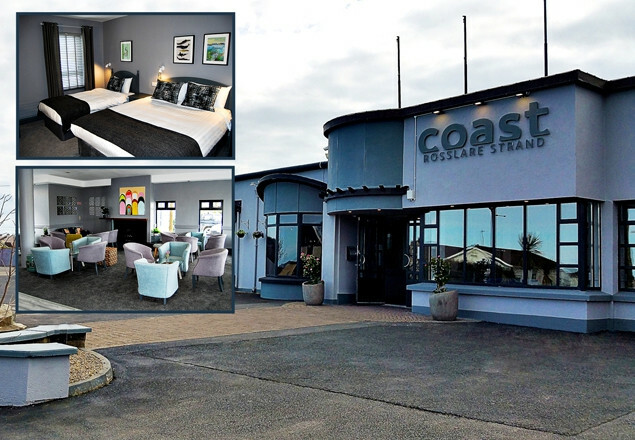 Rewarding Times have again teamed up with Coast Rosslare Strand, Co Wexford, to offer you a 2 night stay with full breakfast, a two course meal for 2, with cream tea on arrival for only €199. Situated in the heart of idyllic Rosslare Strand Village in Co.Wexford, Coast Hotel is the perfect place for a family holiday in the South East of Ireland. Coast is conveniently located in Rosslare Strand, just a 10-minute drive from Rosslare Europort and features beautiful accommodation. Providing free parking and an Electric Vehicle Charging Station , free Wi-Fi, Coast offers you easy access to Wexford Town and the South East region. Our outstanding Restaurant and Bar facilities are the perfect place to unwind. Each room at Coast features an en suite bathroom with complimentary toiletries. Tea and coffee making facilities are also available and each room comes with a flat screen TV and desk. The on-site restaurant offers a relaxed and contemporary setting where guests can enjoy a hearty Irish breakfast, a delicious lunch or a relaxing dinner. Our beautifully designed bar is the perfect place to enjoy one of the many Irish & International Beers on offer along with Spirits and Cocktails which always go well accompanied by something tasty from our dedicated bar menu. Dinner must be booked at same time as hotel booking.